BlacKkKlansman is a political weapon. It has every intent on being one too. Spike Lee rarely subscribes to subtly in his work, but BlacKkKlansman, given its place in time, becomes anti-hate brilliance. 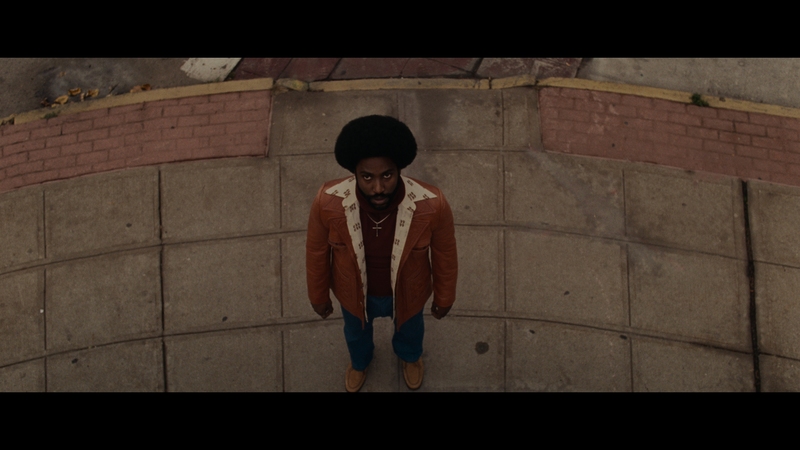 Lee’s BlacKkKlansman rewinds the real world story from 1979 to 1972 to better place the work within Blaxsploitation cinema, the Black Panther movement, and a riled up conservative party backing Nixon. That change appears subtle at a glance, yet puts things closer to the ‘60s Civil Rights movement and the unrelieved tensions of that period. With Lee at the helm, most the era seems like window dressing, an aside for the dialog of the day. The boorish use of racial epitaphs and internal bigotry within the police department do feel of the time. Then Lee slickly steps away. 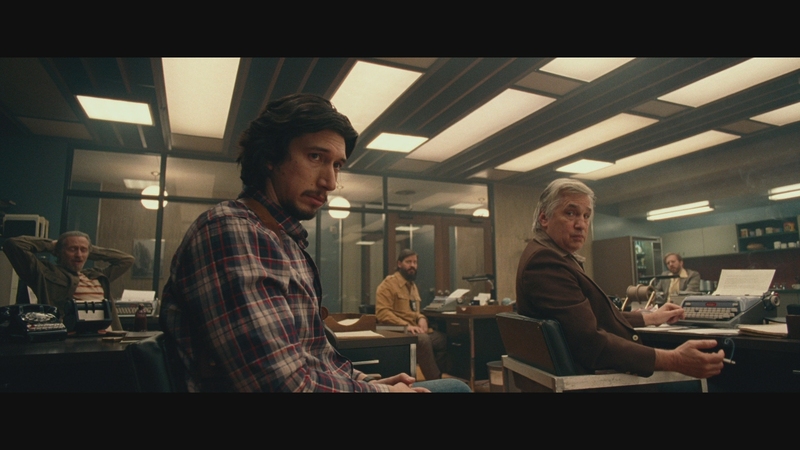 Alec Baldwin opens BlacKkKlansman with a pro-segregation speech, calling people of color “rapists” and “murderers.” Satire, maybe, were it not authentic to contemporary politics. 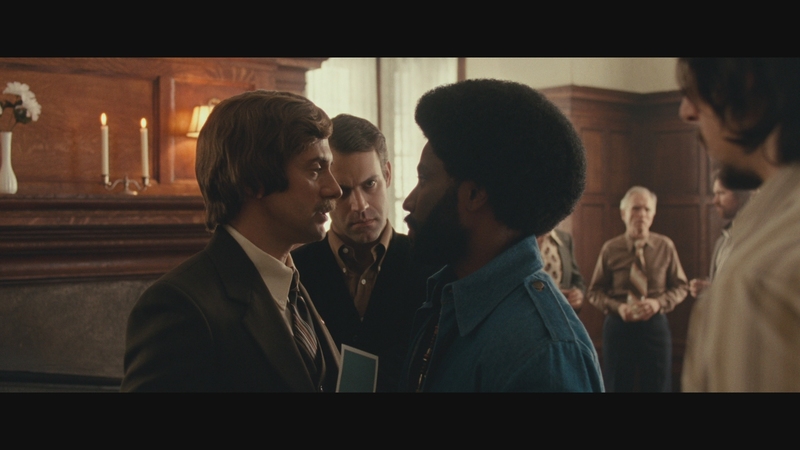 A key scene finds Ron Stallworth (John David Washington) speaking to another detective. “America would never elect anyone like David Duke,” says Stallworth, referring to the Klan leader. Lee’s clearly on the offensive, speaking from today. Later, the Klan gathers at an indoor rally. A scratchy print of Birth of a Nation runs through a projector, members hollerin’ at the events unfolding, whipped into a frenzy. That’s conjoined to a speech minutes later where the excited Klan chants in unison, “American first!” That rhetoric, repetitious and cold, carries Lee’s emphatic stamp. 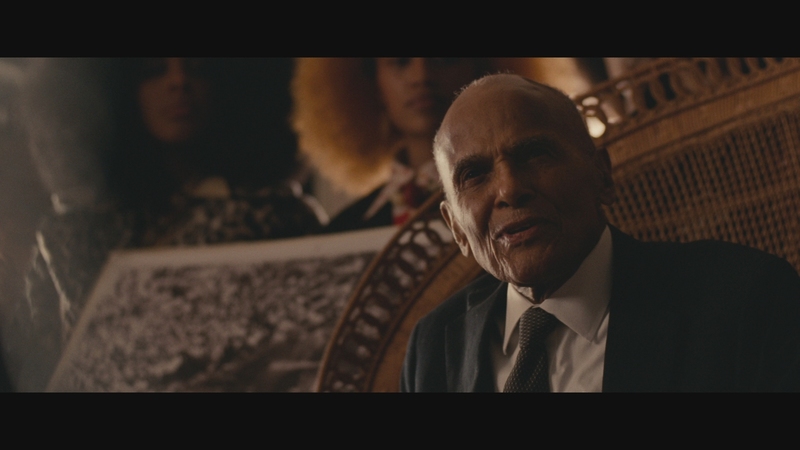 That scene with Birth of a Nation intercuts with an impassioned, grisly story told by actor Harry Belafonte who hardly seems to act all – his revulsion and emotion in telling a story of a brutal torture at the hands of a failed justice system come from empathy and sadness. The shouts of joy from the Klan on the flipside only up their grotesque volume. 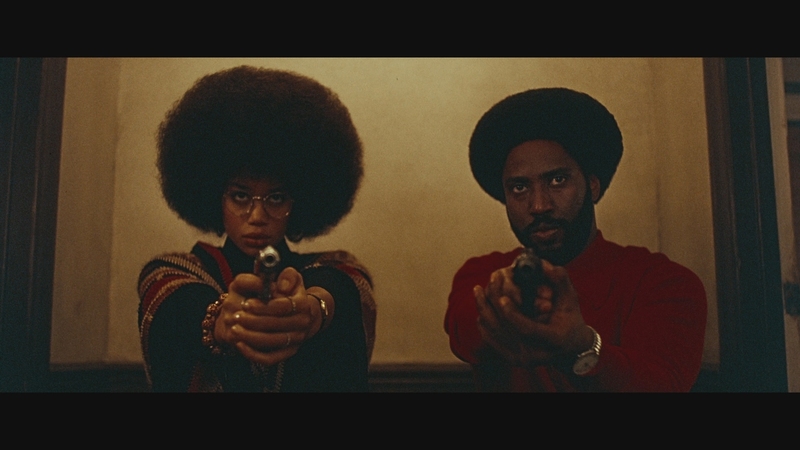 BlacKkKlansman is not a call to violence. Rather, it’s a method to change things through one’s actions. Stallworth’s idea disrupted a white terrorist attack, doing so without breaking his cover or succumbing to an urge to physically fight. BlacKkKlansman’s confrontation of race relations is a purveyor of peace in the face of ghastly action, dressed with mild comedy as to make the events lightly satirical in tone. The final two minutes of BlacKkKlansman either solidify the message or tune out the audience; Lee preaches to a specific set of impacted people. 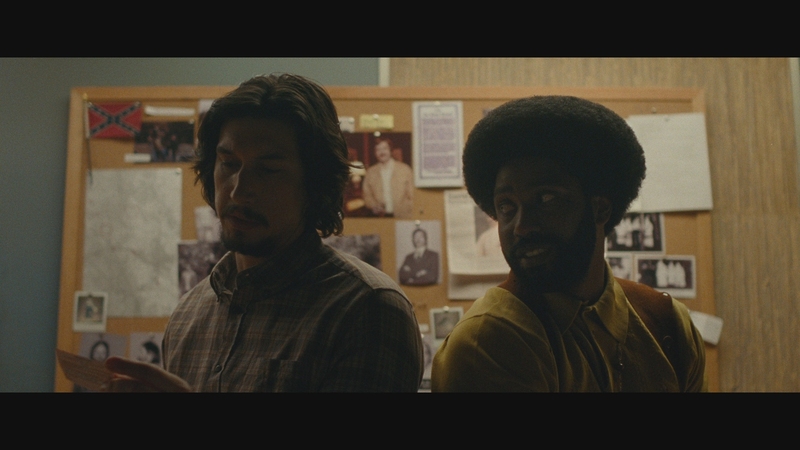 Those who need to digest the stellar, motivated modern allegory likely won’t see BlacKkKlansman. 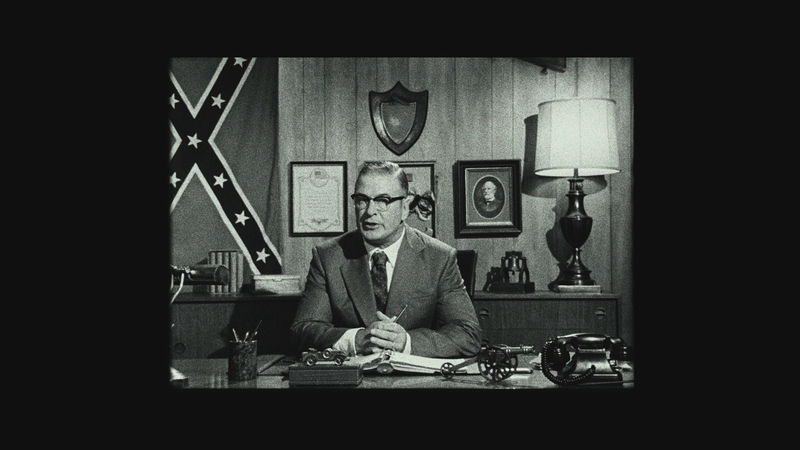 Lee’s methods conjoin Birth of a Nation to recent events. The two meld together, separated by over 100 years, because America’s hate remains a seething, fearful force – louder now than in many years prior. Lee puts words and a face to it. 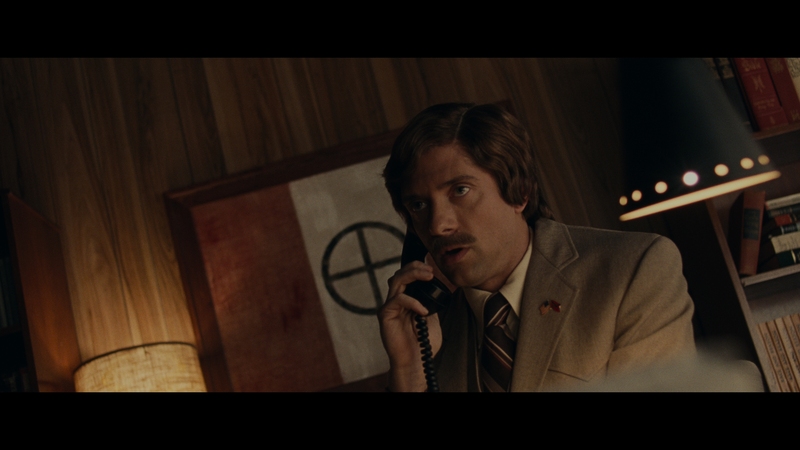 What emboldened the racist movement is shown throughout BlacKkKlansman. Then, with minutes left, it becomes less a comical historical take and jarringly real. 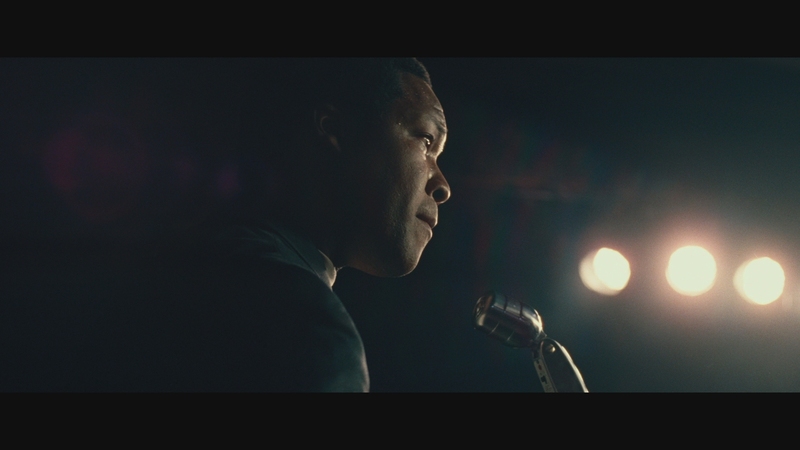 Lee chooses film for this production, then masters everything at a gorgeous 4K. That helps. Outstanding levels of texture and definition feed into this presentation. Close-ups consistently create incredible, natural fidelity. Sharpness does not waver, with wonderful exteriors of the city and various suburban homes. There’s a strong grain structure at play, challenging the encode. Luckily, Universal gives the film a high-end, 80GB+ film size. That’s plenty. 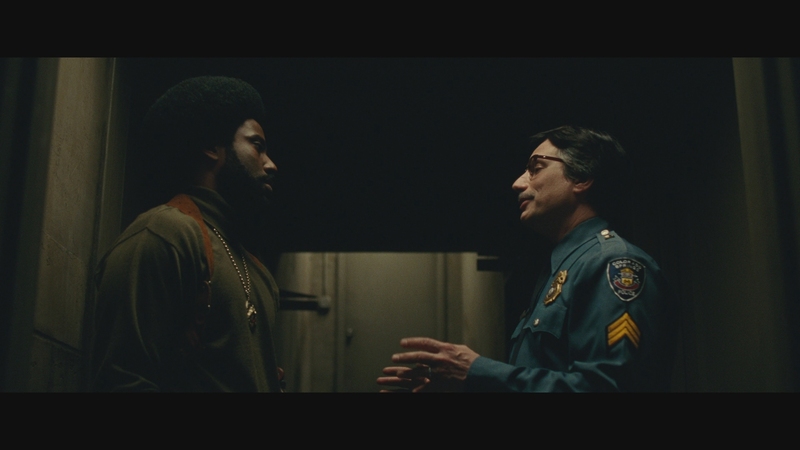 BlacKkKlansman maintains structure, the filmic look maintained cleanly without fault. Not a frame looks digitally maligned. 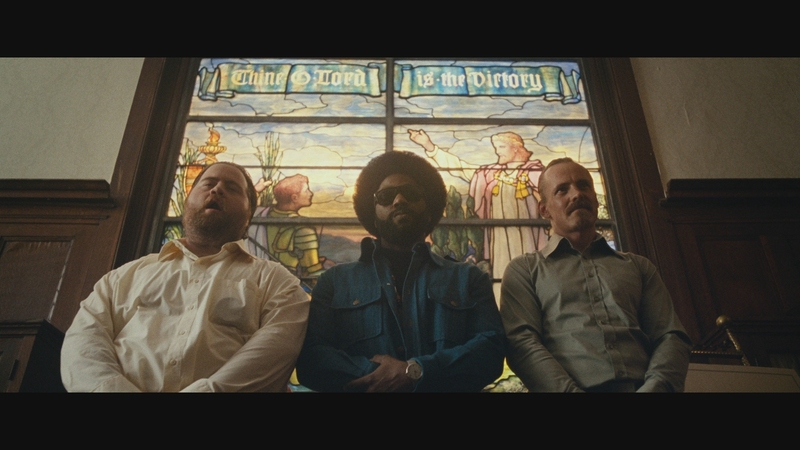 BlacKkKlansman is an interesting HDR case. Dolby Vision adds the highlights, adequate and sharp. Don’t expect too much, although a few shots near a stained glass window pour on contrast. Shadows though remain in their dryer gray, a way to exhibit a vintage aesthetic. Obviously, that’s a knock against depth, but in no way detrimental. The look holds appeal, with a certain class that doesn’t lack depth so much as capture the time. Color helps anyway. Patrice’s red bug shines on screen. Other primaries take on tremendous heft compared to the Blu-ray. Primaries stick out, enriched by the dynamic color. Superb, accurate flesh tones mingle to give BlacKkKlansman a certain hyper-reality. It’s gorgeous. Spike Lee chose to shoot BlacKkKlansman on film. That’s a mix of 16 and 35mm, an occasional switch that sets tone and mood as needed. Universal’s encode doesn’t struggle with either. Grain maintains natural form without turning into digital noise. To give the stock a vintage look, chosen filters muddy the shadows leaving the feature limping in terms of depth. 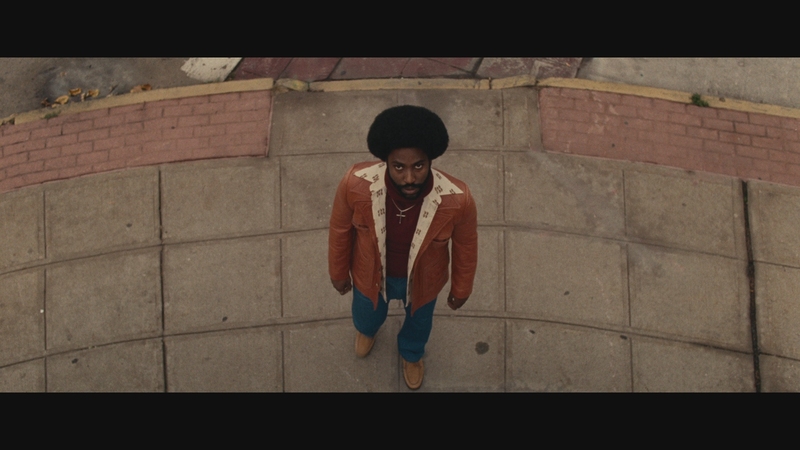 That’s by obvious design, BlacKkKlansman washed out with a sepia tinge as to capture the ‘70s vibe. In that sense, even without much in terms of depth or range, the attractive style wins out. Color carries a warmth as afforded by digital grading, making primaries shine and flesh tones stand out. Scenes in a club mix fashion of the period and eccentric lighting, all brightly saturated. Mastered at 4K, the images produce enough texture. Close-ups resolve facial details and exteriors handle trees, tall grass, and fine lines on homes. A small use of filters does soften things – again, the intent is pure vintage – if not enough to subdue the best qualities. A generous Dolby Atmos track puts listeners in the midst of the various rallies. During an early speech, voices shout out in the surrounds, blending into the rears organically. General crowd sounds whip the mix into an audible frenzy, hyper active and rich. The ambiance remains high. Inside of a home, neighborhood dogs bark on the outside, coming in from the front and rears. Chants from Black Panthers rise in the mix, individual voices standing out from a variety of directions; it’s not only a mass of sound. A sequence of gunfire spreads bullets around, hitting targets in the rears. A smooth soundtrack fills the low-end. It’s small, but enough to give the R&B a pop. Thin extras leave on an unfinished note, even if the feature speaks for itself. A Spike Lee Joint runs a limiting five minutes, but does interview the real Ron Stallworth while others describe how the project came about. The only other extra is an extended trailer. 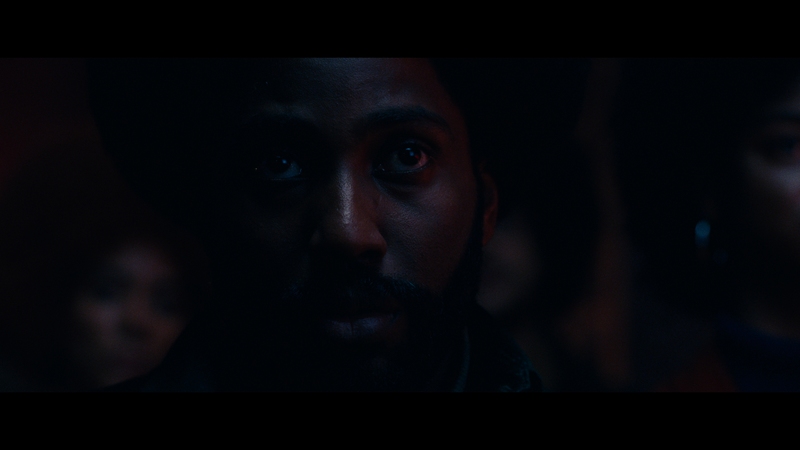 BlacKkKlansman’s final moments make Spike Lee’s message clear, that after an engaging, stellar, and even comical true story. The 15 unaltered images below represent the Blu-ray. 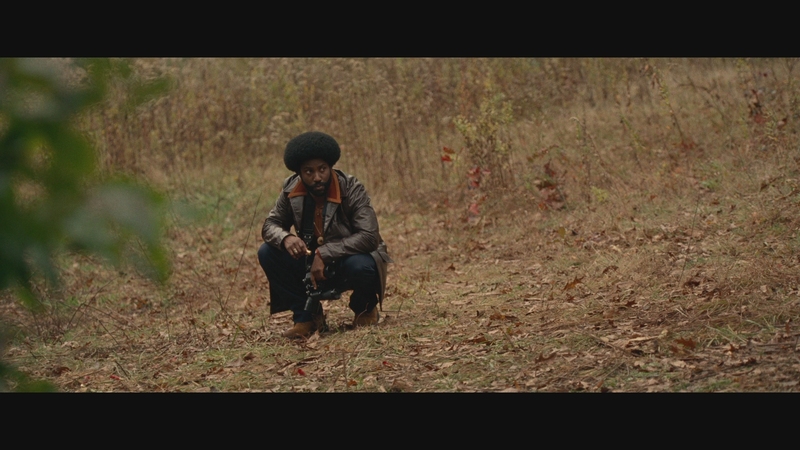 For an additional 31 BlacKkKlansman screenshots, early access to all screens (plus the 18,000+ already in our library), 50+ exclusive 4K UHD reviews, and more, support us on Patreon.